Christmas is a time for memories. I was very lucky to grow up in a reasonably normal home where we had a fairly traditional Christmas. Christmas was a far more modest event back then. Our decorations were of the paper variety and were strung from the four corners of the room to the centre ceiling light. Our Christmas tree was decorated in multicoloured baubles and lots of tinsel. Tinsel also adorned mirrors and pictures on the walls. The only fairy lights were, what we considered to be, very sophisticated Cinderella Carriage lights which were strung on the tree. As a child the magic of Christmas Eve was always special. I remember the mounting sense of anticipation, tinged by the slight worry that I may not be able to get to sleep. One of my clearest memories is of watching out the windows as the light died and darkness fell. My mother would come into the front room and hitch up the net curtains in order to place a lighted candle on the window sill. I gazed out into the street, waiting as each of our neighbours did likewise. In 70s Ireland the only premises that were adorned in Christmas lights were pubs, shops and hotels. So the simple single candle in the windows of homes all over the countryside was a powerful symbol of hope and of welcome. I am a great believer in the need for change and for progress. Life is fluid and little remains the same and that is a good thing. I indulge in fairly lights all over the house for Christmas and I string a set into the tree in the front garden – like many of my neighbours. Candles are a common feature in most homes nowadays and are lit year around. But on Christmas Eve, as the light drains from the sky I often wish it were not so. I imagine a brief pause in all the excitement and a turning off of all the fairy lights – just for a few minutes. In the quiet and in the darkness and with appropriate reverence I wish to could again watch as each house could placed their simple, single candle in the window. Each one spilling its modest brilliance into the darkness of this special night. But instead I will do what I always do. I will close my adult eyes and re-imagine the darkness of the 70s neighbourhood where I grew up and see again the flickering light in each window. I will recall just how powerful and poignant symbol a hope and of welcome these candles are. And I will take my lantern and light my own candle. And although it will be somewhat lost in the glow of my fairy lights, it carries the same, very Irish message, unchanged for many hundreds of years. There is a welcome here. Hope lives here. Nollaig Shona Duit Go Leir! LET IT SNOW, LET IT SNOW……. I still put a candle in my two sitting room windows. They are battery now though. I love that tradition. Lovely post, Barbara, and a tradition we need to pass on, we always lit a candle at home and I still do. Yes a lovely sentiment, the one lighted candle. I grew up in the pitch darkness of the countryside where the lighted candle really meant something in terms of guiding the way. I love the idea of that peaceful reflection. Hope you have a very happy Christmas. They say that less is more and I think the single candle says so much more than the total, roof-to-ground covering of lights that some families have on their houses near where I live. 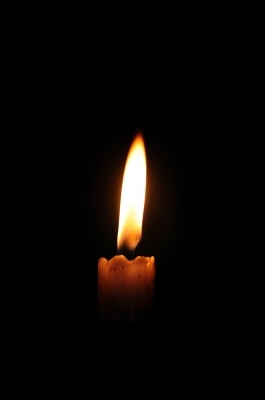 How lovely that you still light your single candle with its powerful and poignant symbol of hope. We all need that in our lives. A lovely Christmas post! We have candles in all of our front windows every year, of course they're electric but still,,,Now I can feel very Irish with my decor. Lovely post, Barbara. Seasonal and timeless. To borrow your image and rephrase a favourite Chinese proverb ' it is better to light one candle and put it in the window than curse the darkness'. Happy Christmas to you, your family and your fellow bloggers. P.
Just wanted to send some festive wishes and love your way! Oh, I love the sense and sentiment. Growing up here in the States, the house decorations were a simple string of ceramic colored lights. Warm and celebrating. Our neighbors decorate with lights and lights. Lighted reindeer, and one, a blow-up glowing Santa. I've managed to stick with the simplicity of the single row of what you might call fairy lights. Small and clear white. But the idea of the connected heart of welcome in a single lighted candle in the window is profound. I'm so glad for the thought of your memory.